Yes! It’s true! You can now hear me and other Presentation Design professionals on a new Podcast entitled The Presentation Podcast! New episodes will be available 2 times a month and we’ll cover different topics each week! I am constantly listening to Podcasts, so I am extremely excited about the opportunity to put together a new Podcast specific to the presentation industry. The hosts are Nolan Haims, Sandra Johnson and Myself. We will have discussions all about presentation design, best practices, running a design studio, tips & tricks and lots more so be sure to tune in! Add The Presentation Podcast to your iTunes Podcasts and join us for the fun! The great thing is – a video placeholder works with Morph. Here is my two slide sample, the video on the second slide has been resized to full screen. Why is it called 2K-4K-8K? 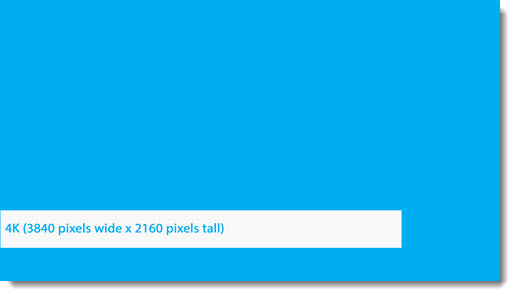 An easy way to know what to call a resolution is to look only at the horizontal pixel count. 2K, 4K, 8K, etc. all refer to the horizontal resolution – approximately that number. 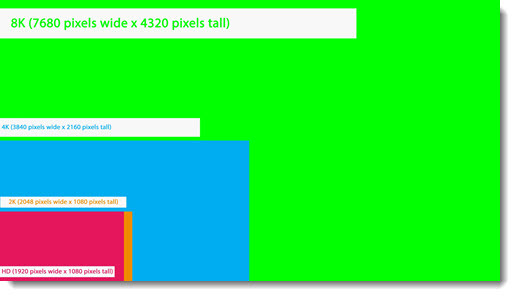 Note: For this post, all resolutions referenced are for 16×9 aspect ratio displays (with the exception of 2K). 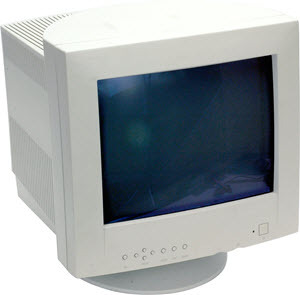 HD, or High Definition, is used for two resolutions 1280×720 or 1920×1080. These are commonly referred to as 720p or 1080p (see this post that explains “P” and “I”). I am going to refer to 1080p as HD. HD, or High Definition, almost 2K, but not quite. 2K resolution is 2048×1080. It is a long story why computer displays did not just go with 2K, we’ll save that for another post. But needless to say, true 2K resolution is not used a lot in an HD world. Like HD, 4K is actually 2 different resolutions depending on the context. The resolution we use for PowerPoint resolution and 4K monitors is called UHDTV 4K @ 3840 x 2160 pixels. 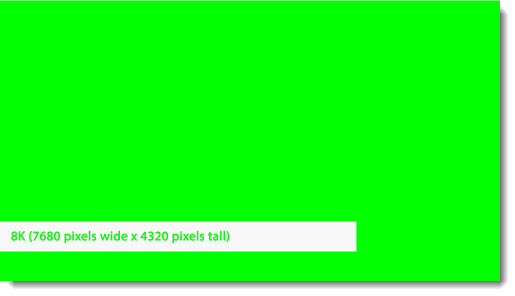 The film industry will use 4096 x 2160 pixels, but this is not a 16×9 aspect ratio so it is not a part of this discussion and something you will most likely never use. Yes, I am skipping 6K (noted below), because 8K is the next industry standard, also called UHDTV 8K @ 7680 x 4320 pixels. 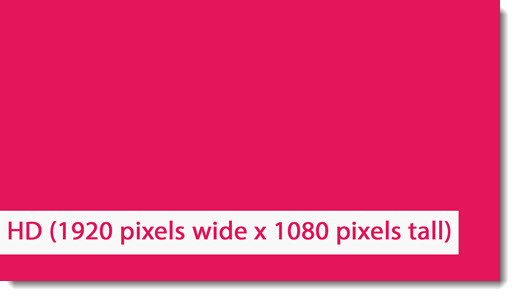 This is a lot of pixels and yes we design presentations for beyond 8K projection! 6K, 10K, 12K and beyond are all resolutions, but they are not industry standards. Here is a quick list of resolutions, that includes them for reference. 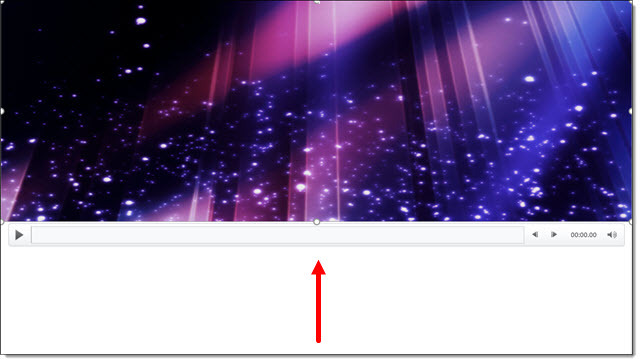 The playback bar is available in slide edit view – when a video is selected, it appears. The playback bar can be used to preview the video, click-and-scrub through a video, pause a video, and see a live time code. 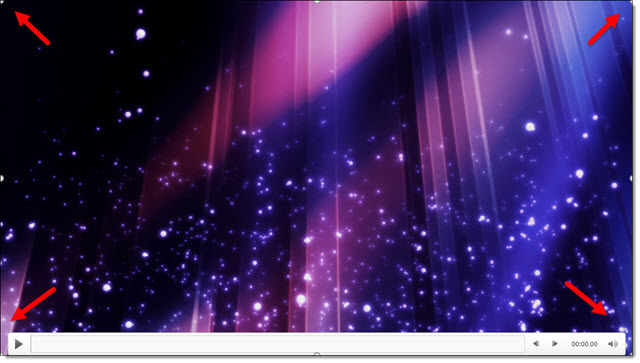 Timeline bar (click anywhere on timeline and jump video to that position, click-and-drag and “scrub” through the video forward and back). The semi-transparent playback bar is not overly distracting because it’s nicely designed. Here are a few examples over different color videos. In addition, these two videos are on the same slide, side-by-side. See demo video of this slide below. 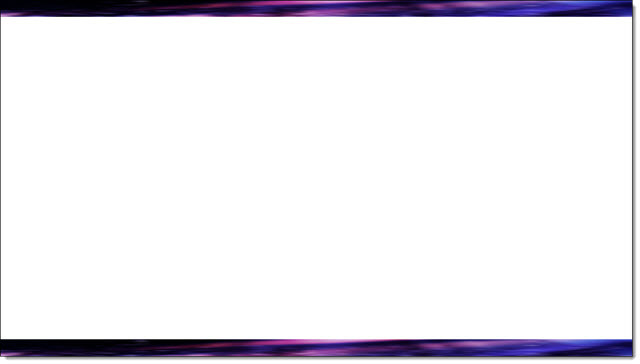 What we’re doing here is creating a top and and a bottom banner by inserting a stretched video with animation. 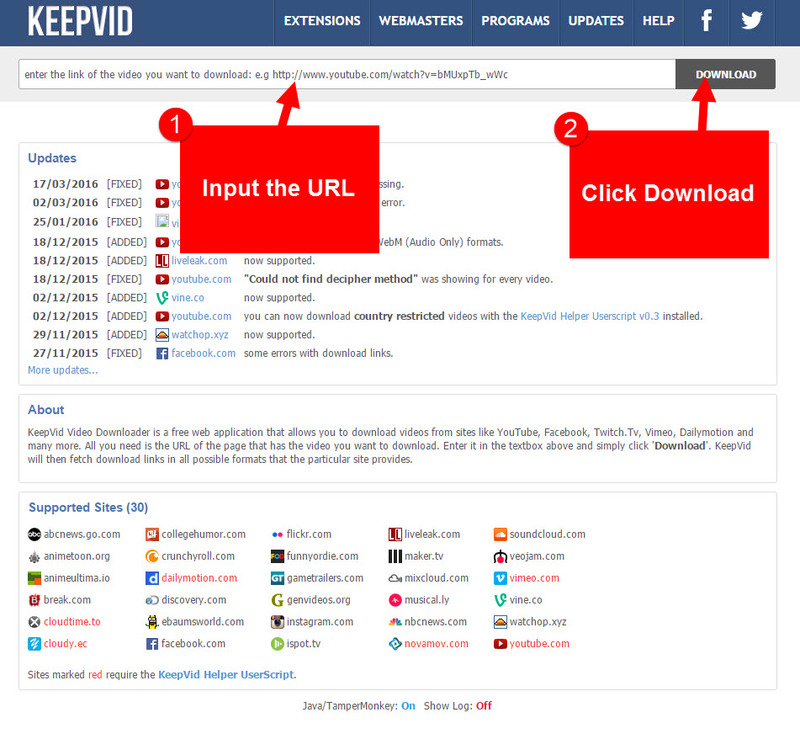 There is a video demonstration below. Using auto advance for transition is easy, but calculating when a video will end in order to add in the correct auto advance timing is tedious. 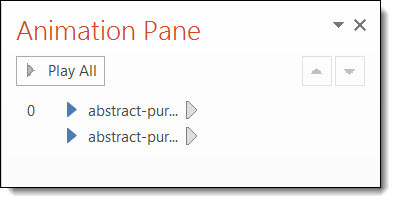 However, it turns out that we do not need to actually figure out how long a video is because PowerPoint cannot use the auto transition feature to override a video that is playing and advance, even if we want to (the solution is to trim the video to the shorter duration or manually advance the slide). 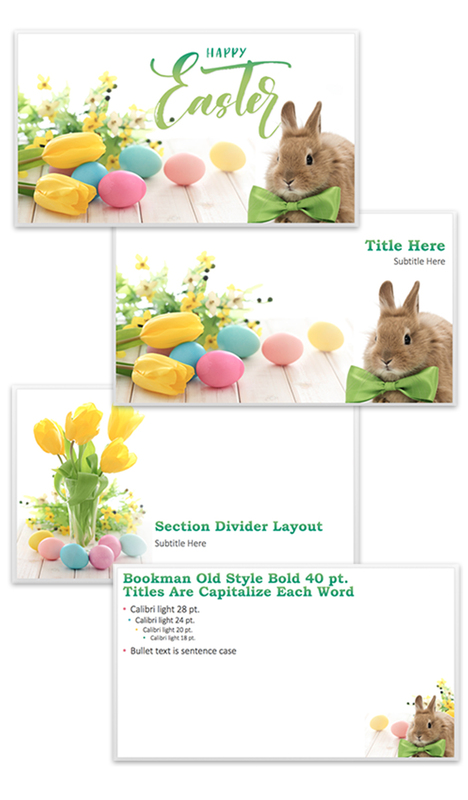 Slide has video, presenter wants presentation to automatically go to next slide when video is done – easy. On video slide, set to auto advance after 2 seconds. This assumes the video is the only animation and it is going to start playing automatically. 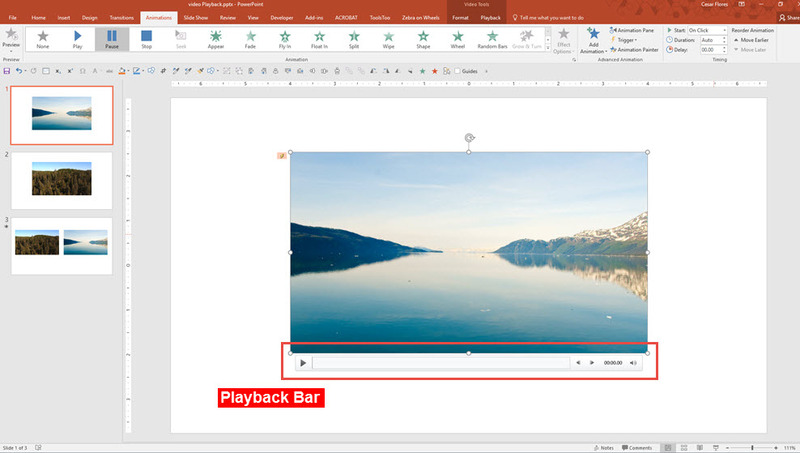 PowerPoint will go to the video slide, then the video will start playing and trigger to auto advance to next slide after 2 seconds, but it cannot do so until the video is done playing, so it waits for the video to finish. When the video play animation is done, the slide automatically advances to the next slide! 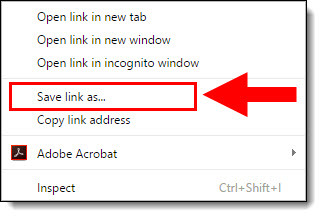 We use this feature to help us easily setup what could be a complex request. AudioBlocks.com is a great resource that TLC Creative Services uses often we’re looking for sound to put in a presentation. Audioblocks is a sister company/service to Videoblocks which we reviewed in the previous post. AudioBlocks is a subscription service (i.e. Annual fee) and you get unlimited downloads. The entire audio library is royalty-free so you can legally download and use sounds in both commercial and personal projects, without having to pay any additional fees. The library has over 100,000 sound effects, loops and music and adds new clips continuously. 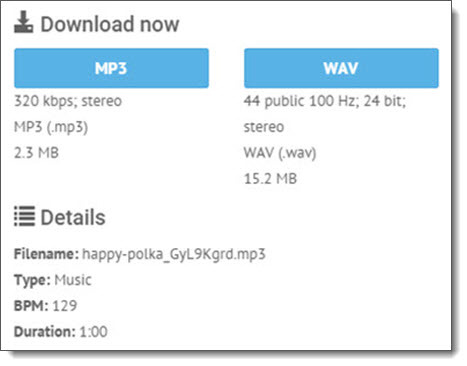 Clips are available in MP3 and WAV file formats. A really good option is that the Search feature can be filtered by keyword or style. 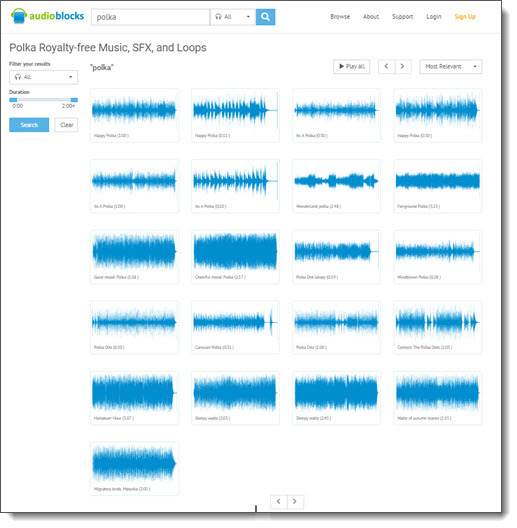 Searches can be filtered by music, SFX or loops. My favorite search option is by duration to further focus the results. Additional search filters are by Music category, genre, mood, and even instruments. Daetona did a sample search for polka music and found 21 results (that’s a lot of Polka!). The duration of clips ranged from 00:11 seconds to 03:23, and if I needed just a short clip, the duration filter would even further focus the results. 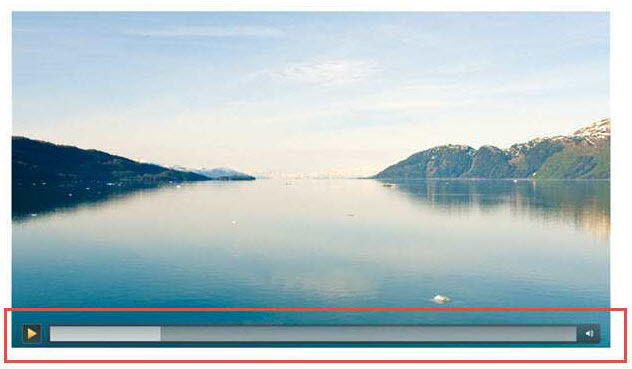 TLC Creative has been using AudioBlocks’ online subscription since it launched a few years ago. We were even a customer of their CD-ROM collections before that. The lowest price I have found for an annual subscription is currently $99/year. A less valuable monthly subscription is also available for $79.